This is one of those books which has a good premise and the starts of a good plot, but somehow jogs along, with the reader getting a little lost in the detail. Why is Bran so affected by the farm – the level of animosity towards the place is never truly explained. Kaden is a much more likeable character, but he struggles without a strong foil to bounce off. Chris is an interesting but flawed addition, who seems to act both as Bran's friend, but also as his conscience – which is a disturbing role for a lawyer!! I was confused that he could see the will and the conditions but Kaden, Trent, and Sam had no idea of its contents. I did like some of the scenes a lot, but some were difficult to place within the context of the whole. I am curious to see how things progress, as the whole may explain some of those things which are elusive here. Kara Nash and Caitlin Ricci are both new-to-me authors. At the start of Dare to Risk, I was pulled in and found the story to be emotional and enjoyable, but the dialogue to be rather wooden and stilted. At the start, obviously the book sets the reader to pull for Kaden and not Bran, on who is right and who is wrong about the situation. There are various moments where the reader's emotions are tugged – "I want this place to burn to the ground," where we expect some major revelation of wrongdoings occurring by the grandfather on the farm. That never occurs, which makes Bran a neurotic character who is borderline evil with his thoughts – like burning down the farm and sending the animals to slaughter. To sell a place because you're set in your life, don't need the extra stress and hassle, that is an entirely different beast. To spew vitriol means there is bad blood there, right? I apologize for going off topic. At the core of it, I believe Dare to Risk would have been a good read, going by the premise, but the execution was sorely lacking. The editor needed to rein the authors in. It just didn't come together. Ordinarily I could devour a book like this in a few hours. 5 days later... I'm just now finishing it, and I don't think it was my mood. In the beginning of the book, it's set up for love/hate, a clash of personalities that I so much adore. Totally up my alley. But the storyline was so good in the beginning, where I wanted to know more of what was happening and less about romance, that the lusty thoughts felt out of nowhere and forced. It didn't flow organically, and the sexual thoughts popped out of nowhere in the context of what was currently happening. Even though there are two narrators creating a romance, two other parings are playing out as well, which was a distraction from the main couple. The BFFs – all gay and into one another. Chris is stereotypically a mess, pushing himself onto Kaden's friend, when the man showed no interest whatsoever – 'we met, so now we're together, desperate attitude', 'won't take no for an answer, so when you reject me, I'm going to do something reactionary and stupid, then make you feel bad for me when I get hurt'. Sam sounded like a disapproving, disappointed parent, but I don't blame him one bit. Bran and Chris acted like spiteful tweens. Kaden was back and forth with himself. Trent was just there, except when Chris's brother was mentioned. Bran was all over the place. At the end of the book, as the reader, I still couldn't accurately predict their actions/reactions because their personalities and traits changed from scene to scene. All were mature adults, with career responsibilities, yet they acted like children. Dare to Risk wasn't to my tastes, but I will read the next in the series. Perhaps if I'd read the story in one sitting, read it quickly without contemplating things or mulling over the story, I would have been reading another book before the 'wait a minute' popped into my thoughts. I took Bran hating the farm at face-value, expecting a horrific admission, and I would have already been reading another book before I realized there was absolutely no validity to Bran's attitude whatsoever. But since that revelation came on quickly at the beginning, and I kept reading it as if it was some big mystery to keep myself engaged with the story, but there was never anything to reveal, I'm frustrated and find Bran one of the most vapid characters since there was no rhyme or reason – other than divorce, which is an issue with more than half of the US population. The rest of my issues are fully covered in other reviews, so I don't want to go into greater detail than I already have. If you're looking for a light book, one you don't dive too deeply below the surface, you'll probably enjoy this story. 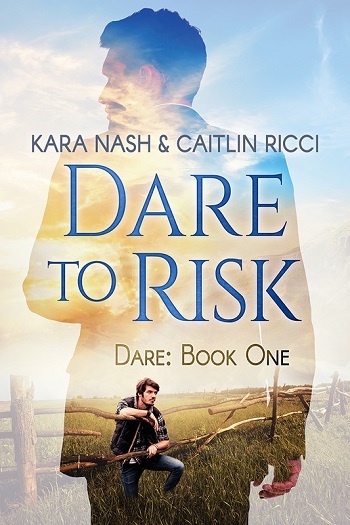 Reviewers on the Wicked Reads Review Team were provided a free copy of Dare to Risk (Dare #1) by Kara Nash & Caitlin Ricci to read and review.